The bridge that did not give up without a final fight! 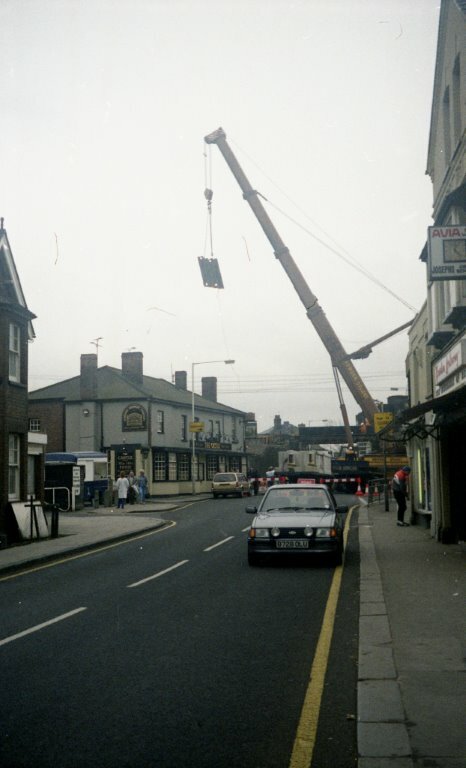 In the summer of 1988 Wickford High Street was closed to all vehicles as the railway bridge was replaced. The railway was shut down at around midnight on the Friday night and the contractors had to meet a deadline for the railway to be reopen to the first scheduled trains on the Monday morning. The bridge had other ideas! 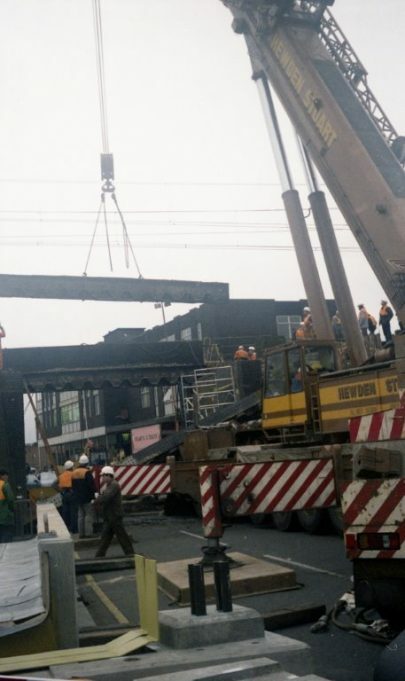 A large mobile crane had been positioned to remove the steel beams from the brick supports. 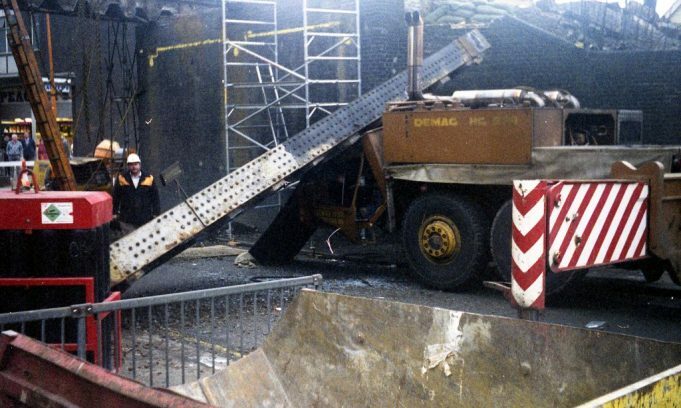 Each steel beam was reduced in size with oxyacetylene cutting torches to reduce the weight for the crane to lift. The lift on one steel beam went disastrously wrong, the beam came out off the lifting slings or the lifting tackle broke, I don’t know which. This resulted in the beam crashing down on the left-hand side of the cranes road driving cab, which happened to be the side where the steering wheel was! These large cranes have a lower cab for driving the vehicle on the highway and a second cab on top of vehicle to allow the operator to see the jib and operate the crane safely. The damage to the cab can be seen in my photographs. No one was hurt. 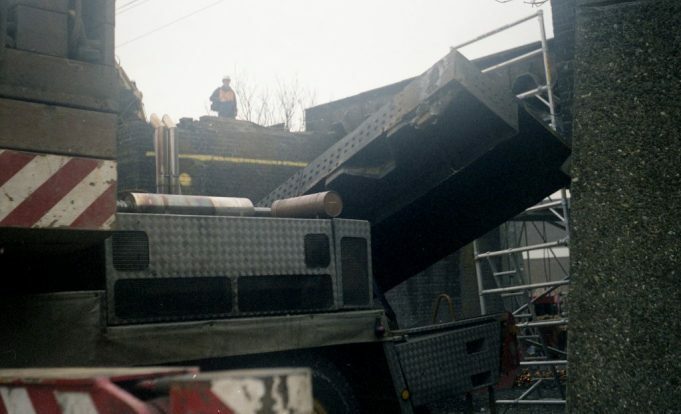 The contractors had a big problem – a tight time schedule to meet and a very damaged vehicle. 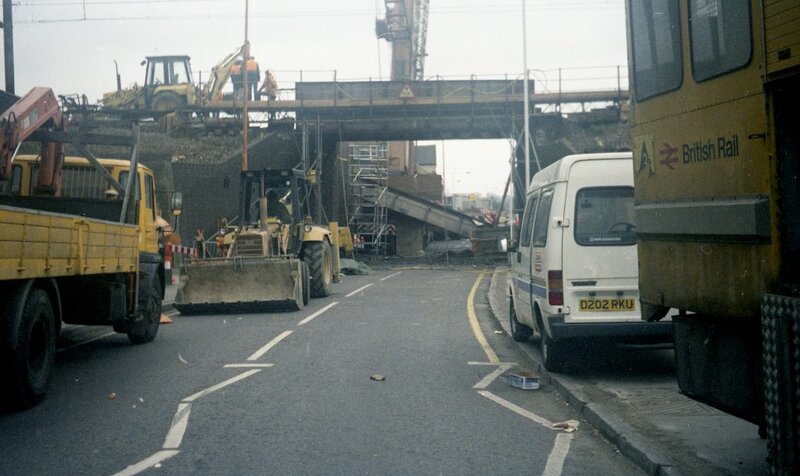 They finished the removal of the old bridge steels to allow bricklayers to remove some of the top layer of bricks – see yellow line on photograph – and to position new concrete padstones to support the replacement bridge. These padstones can be seen in the excellent photographs provided by Paula Sloane on this website. 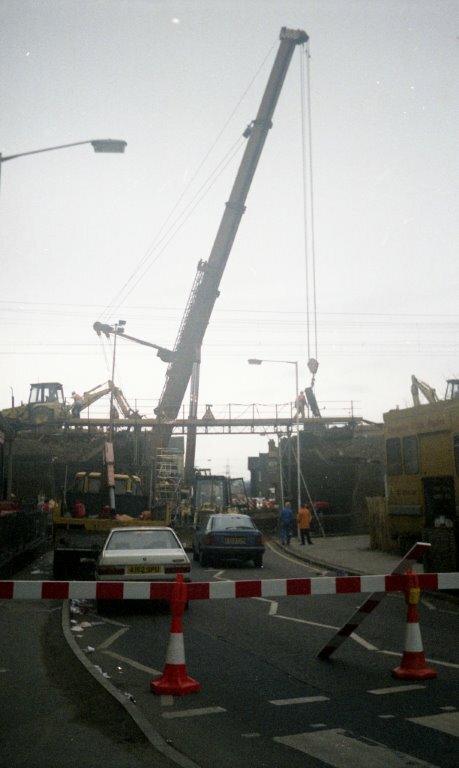 They then attempted to use a JCB type digger to straighten the cab sufficiently to allow the driver to move the crane. 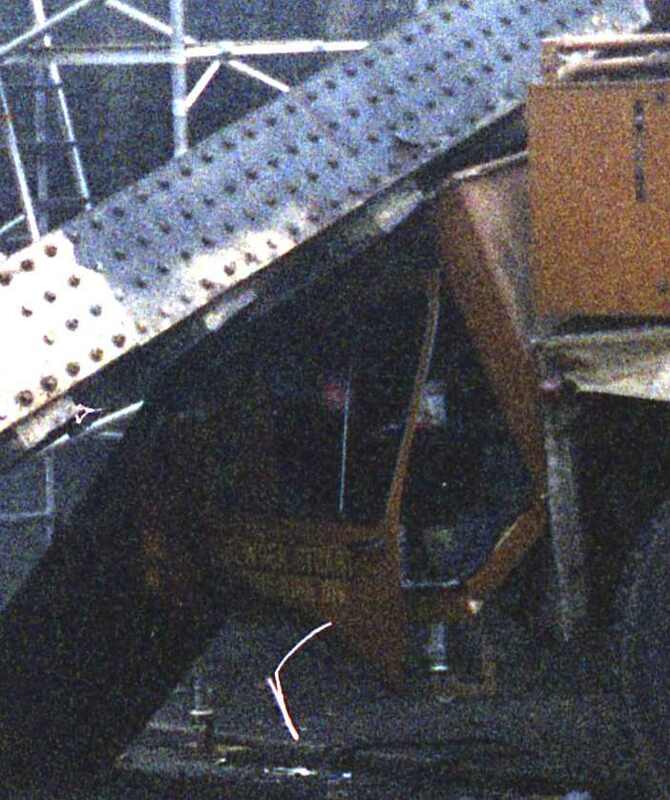 Chains and props were used to bend the cab and create space for the driver. I can’t recall exactly what happened after this straightening, but I do remember a temporary plywood cab arriving on site and being fitted to the crane to allow it to be moved off site. 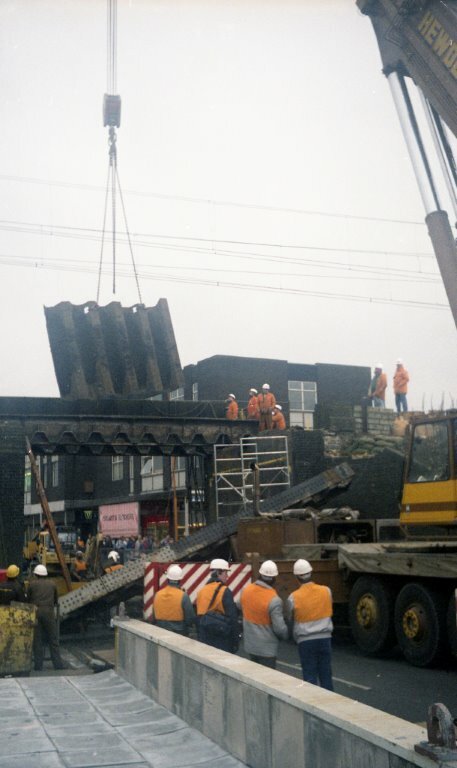 With the ability to reposition the crane the new bridge sections could be lifted into place and this allowed the work to be finished on time for the first Monday morning train. What is the best way to remove? Is this the boss arriving to decide on how to deal with the damage? 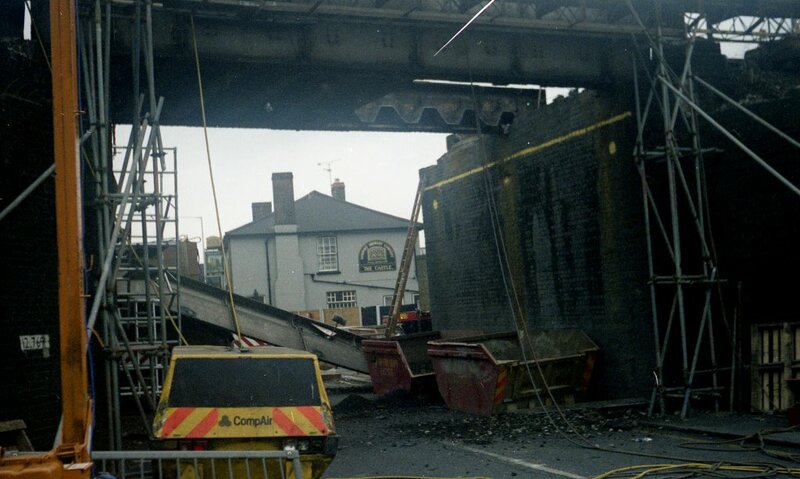 Note the yellow brickwork removal line. The new concrete padstones were placed at that height. 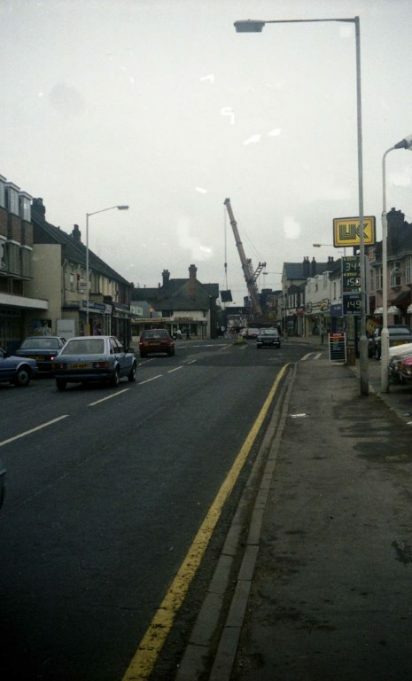 Crane at a distance, note the size in relationship to surrounding buildings. Petrol prices at Swan Garage 34.9p per litre! It fell off the back of a lorry! Joy riding in the skies over Wickford, 1928. The Buses that came through Wickford. 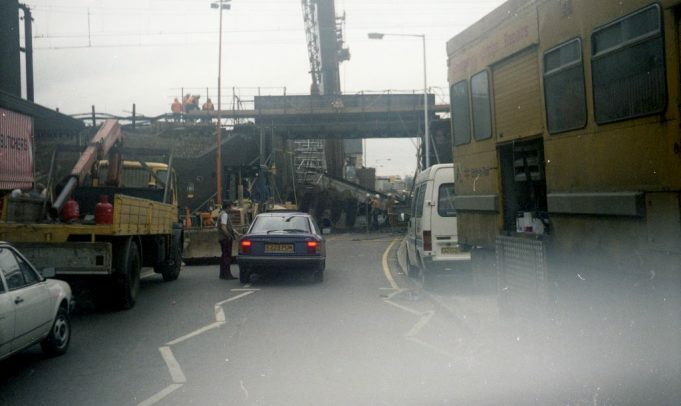 The Railway Bridge from the Broadway.